A few months ago, I had the distinct pleasure of meeting Priscilla Shirer and her husband when they visited my Shoppe. Priscilla is an incredibly accomplished author, motivational speaker, and Bible teacher. She graduated with a Masters degree in Biblical Studies from Dallas Theological Seminary, was mentored by Zig Ziglar, and conducts classes alongside Beth Moore and Kay Arthur. Her experience, education, and resume is beyond impressive, but it doesn’t even come close to encapsulating her. Her inviting warm spirit is like a magnet that just draws you in, she's amazing. Priscilla and I have been exchanging emails over the past few months and she was gracious enough to offer a guest blog post for us today. Thank you Priscilla! So without further ado, take it away Priscilla…. I woke up this morning to a different view. You see, for the past week I’ve had a glorious vacation. Jerry and I celebrated our 10th anniversary by taking a trip with a few friends. Our room was right on the beach. The comfy bed, in the spacious accommodations, faced a wall of floor-to-ceiling windows that showcased an explosion of beauty each day. Early in the morning, the sun rose over the clear greenish-blue waters of the ocean. Each evening, I’d stare out of those windows and watch the sun kiss the day goodbye as it left orange footprints dancing on the still waters. As far as I could see, the ocean spanned out for miles around, spotted only with coral and the occasional passing boat. For five days and nights I took in the grandeur of this breathtaking view, breathed in the sweet ocean air and rested in the peaceful serenity. This was something to behold; a view hard to beat. I got back home last night. It was a long day of travel and we were exhausted upon arrival. We dragged ourselves into the house, pulling our carry on luggage, and tumbled into bed. When I awoke this morning, it took me a moment to get my bearings. I rolled over in bed and for just a quick second expected to see the rolling waves of the ocean, the white sandy beaches overrun with seashells and tiny hermit crabs. When I opened my eyes, I was looking for those floor-to-ceiling windows that had given me the view of lifetime for the past few days. But my eyes fell upon a different view. It’s the view from here. 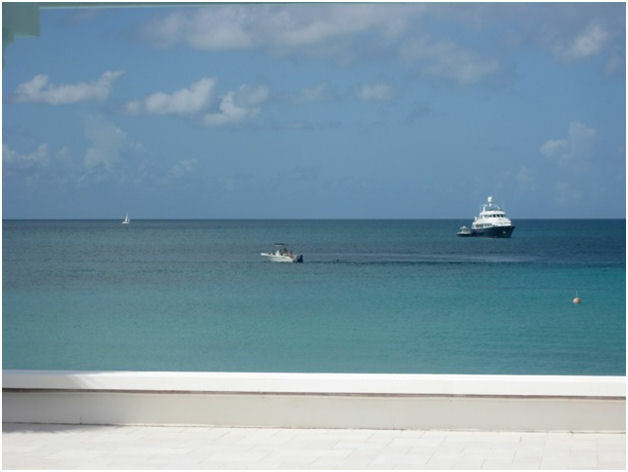 My undressed bedroom windows; streamlined, boxy and without the architectural detail of the room I’d been in, they didn’t look out on the majesty of the roaring waters of the Caribbean Sea. I opened my eyes and took in a view of trees and fallen leaves. 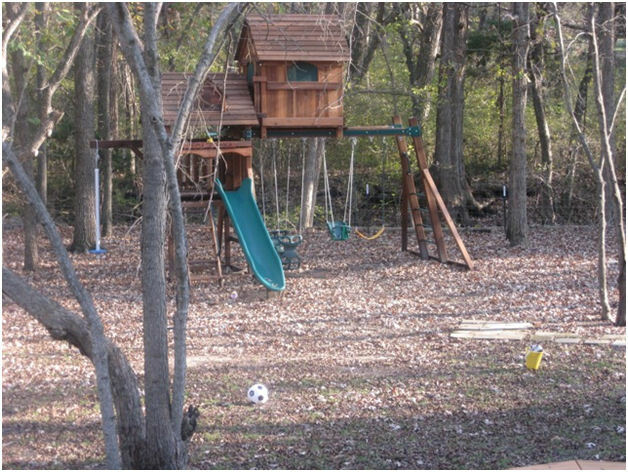 A backyard of unkempt landscaping and scattered toys. A swingset filled with cobwebs, surrounded by branches that need to be picked up. Is that the cup my son was drinking out of last week under the slide? Ahhh. Now it’s all coming into focus. I’m home, and this view reminds me of that for sure. And that’s when it happened. A smile surprised me. It crept its way from my heart to the corners of my lips. My soul felt warm and at peace. My shoulders relaxed and I felt joy rising. I’m home, and this is the view that reminds me that my family is here. That there are memories we’ve made and more yet to be created. The ocean is beautiful, but the view from here is where my heart is. And this is the most beautiful view of all. So nicely written. Oh yes... "There's no place like home", "Home is where the heart is"... "Home Sweet Home". One of God's blessings! What a lovely story, I needed this today! Thank you for sharing this beautiful post with us! Absolutely beautiful post... it's always good to be back at home! love love the sound of ocean waves, warm breezes and sand between my toes. out my window at the disheveled and leafless backyard that yes home is where my heart is too. Such a touching post. Thank you Priscilla for sharing with us! I can so relate to this post. Last year my husband and I spent a week in Florida and my sister kept our 2 kids. I was so sad for the trip to come to an end. But, when we arrived home, I was never so happy to see a destroyed house and piles of laundry. Wonderful post! Love this post,but thanks for reminding us the best place in the world is HOME! I love this! Really puts things into perspective. I always love my time spent on vacation but there is nothing better than being home and sleeping in your own bed. And "home" may be the second most beautiful word in the English language. Lovely post. I love Priscilla! She has spoken at our church several times...she has such a gift with words. Great post!